The Kartell Masters chair was created by the designers Philippe Starck and Eugeni Quitllet in 2009 and represents a tribute to the "big three". 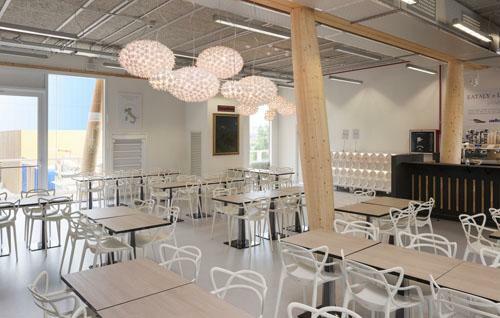 On closer inspection you can see the chairs from Philippe Starck took his inspiration: the series 7 chair by Arne Jacobsen, the Tulip armchair by Eero Saarinen and the Charles & Ray Eames Side Chair can all be seen in the back rest of the Kartell chair. 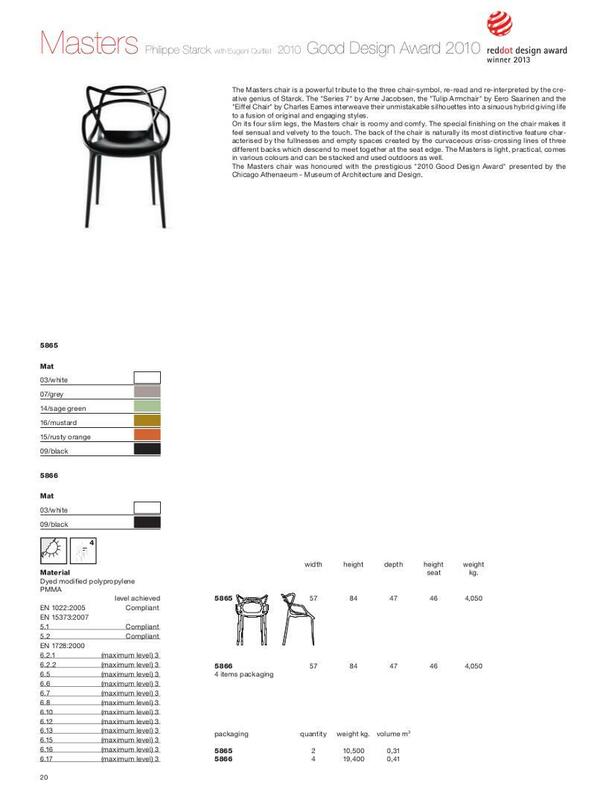 The Masters chair from 2009 was designed by the designers Philippe Starck and Eugeni Quitllet for the Italian producer Kartell, and represents a formal tribute to the "big three". On closer inspection you can see which chairs served Philippe Starck and Eugeni Quitllet as a model: in the backrest one finds the unmistakable curves of the Series 7 Chair by Arne Jacobsen, the Tulip Armchair by Eero Saarinen and the Charles & Ray Eames Side Chair. 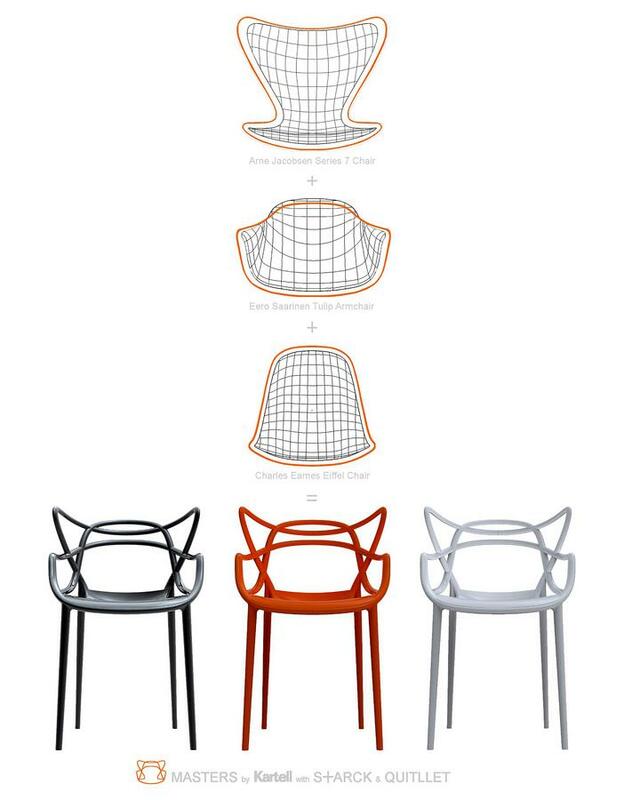 Characteristics of the three cutting-edge designs merge into the Kartell Masters chair and are thus reinterpreted by Starck and Quitllet for a new generation raised on the mash-up and mix. The silhouettes of the three chair backs superimposed on one another create a backrest made of filigree struts and open spaces, a combination which gives the Masters Chair a transparency and lightness. Moulded from dyed polyethylene the Kartell all-purpose chair is suitable for indoor and outdoor use and is available in a range of colour variations. For over 50 years Kartell has focused on the production of designer furniture made of plastic, and objects which are characterized by individuality and possess an innovative character.